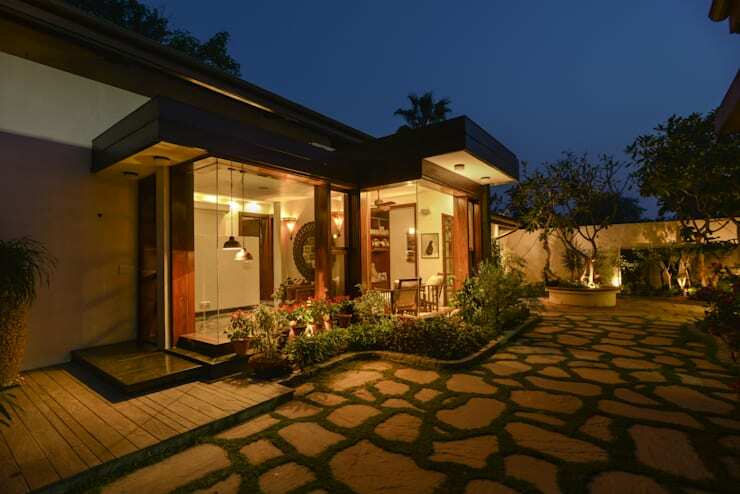 In this edition of homify we visit a magnificent home in New Delhi, India and take a tour through this elegant farmhouse that so excellently blends the charm and splendour of ancient décor and modern minimalist style. 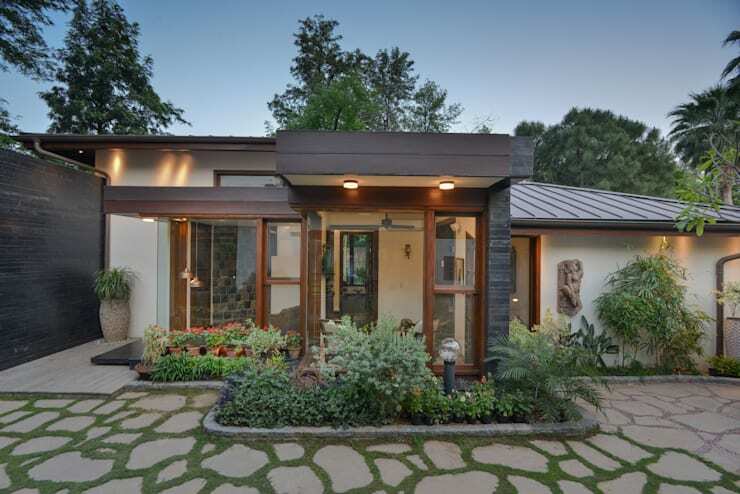 This tasteful designer home was perfectly created and decorated by Monica Khanna, who has allowed the character of this rustic farmhouse to become a homely atmosphere that enjoys the sights and sounds of the surrounding environment. The use of intricate woodwork and metal detail has made this country home fit for royalty! This elegant exterior provides us with a glimpse into the indoors of this magnificent home that has been so perfectly designed taking into consideration the rustic elements of vintage living and stylish decor. The outside view of this home shows off its salute to the environment, with the incorporation of greenery into the design. The elaborate decorative stone and woodwork shows extreme attention to detail has been included in the design of this home, while the royal entrance is nothing short of pure artistic beauty. The plants have added an extra degree of wonder to this exterior dynamic. While the framed doorway is manufactured from high quality materials, making it open, exclusive and rustic. New homes so often ignore the refined and important things in life, such as reading and study areas, but this home has so perfectly captured the surrounding beauty of this compact study area with the environment and views from within as well as the outside. This is certainly a light and bright space that has everything to open your mind and begin reading that book you've had for ages, or why not take up learning a foreign language? 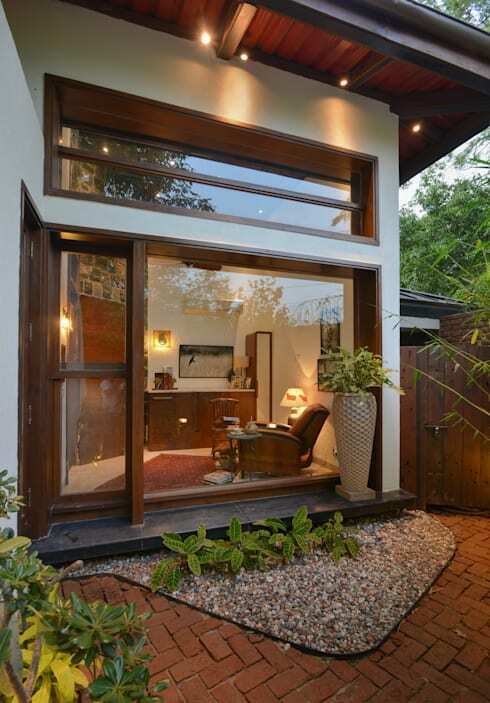 The wooden doors, paneled glass and perfect frames allows the occupant to have a picturesque view of the green outdoors, while the lounger located in the middle of the room is the perfect place to just enjoy the serenity enveloping the home! Well a living room such as this fits in completely with the design and decor of both the interior and exterior of this farrmhouse. The wooden elements such as the two chairs with the comfortable pillows are rustic and elegant, while the fantastic wooden door frame almost transports us to another era, one of style and charm. 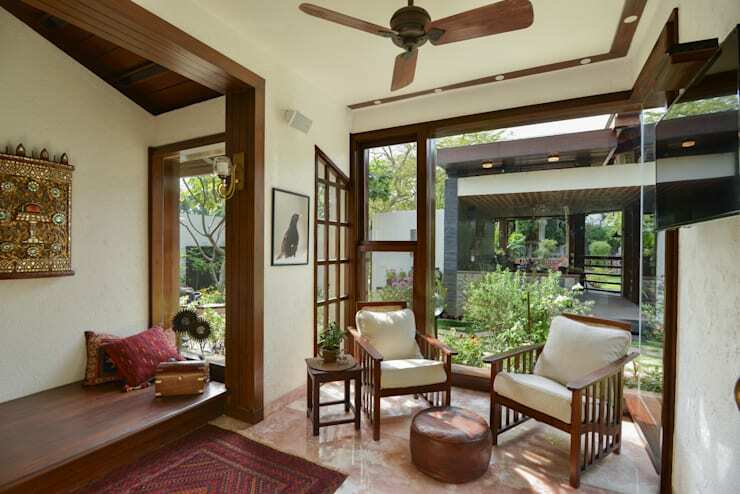 The exposed wooden beams further accentuates that vintage inspired look, while the tranquility of the surroundings can be appreciated, the antique jewellery and Indian artifacts further accentuates the designer home experience. The wooden fan perched perfectly in the middle of the high ceiling creates a comfortable and relaxing atmosphere to be enjoyed regardless of the season. A bathroom such as this has never been seen or experienced before with the absolute perfection that makes this dynamic home of ornate decor so much more special. 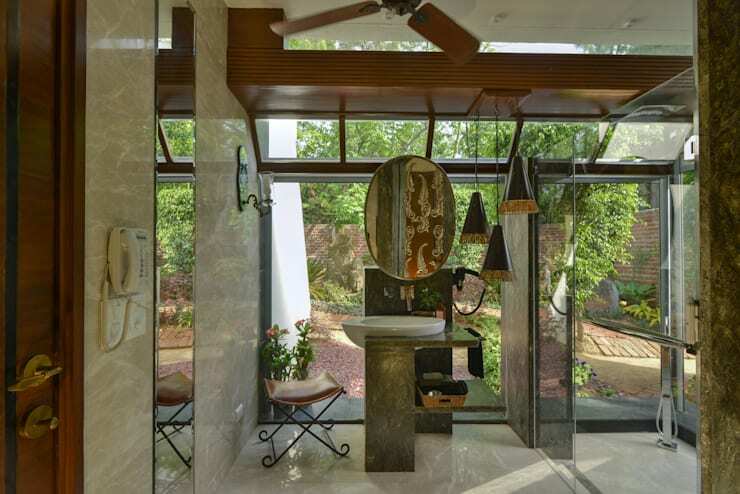 The view from the bathroom into the tropical forest surrounding this farmhouse allows you to feel miles away from civilisation, while the perfectly placed fittings and fixtures are elaborate in their own manner. The large windows provides an abundance of natural sunlight throughout the day, making this bathroom perfectly illuminated and a simple designer space of stunning materials such as marble and wood, adding a luxurious touch to this bathroom too! A spa area in a normal home may be a bit much, but because this farmhouse already has all the elements of an expensive weekend spa experience, including a home spa into the actual planning was a must-have! The setting of this country villa is rustic, lush and green, which is why a spa makes the experience so perfect! 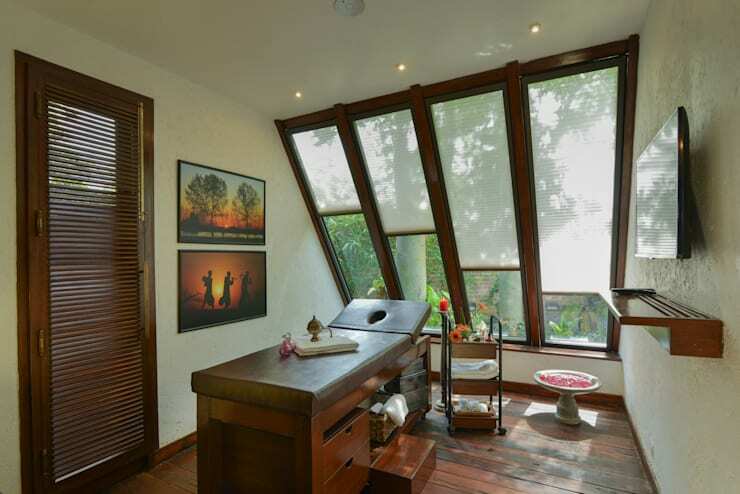 The large window provides the perfect addition to this simple room, decorated with wood throughout and fit for royalty, a spa will allow the occupant to get in touch with their inner self and take in all the aspect of beauty from the environment to make it a completely rejuvenating experience for mind, body and soul. The Zen emitting from this spa is almost electrifying! This stunning home even makes a beautiful vision during the evening light, the brilliance of the indoors certainly shines through the outdoors, making this home come together well and a peaceful experience for the inhabitants and guests who stop by to admire the subtle brickwork and glass elements, the fantastic French doors and large windows as well as the proximity to nature. The beautiful glow of this ornate masterpiece is attractive throughout the day and even heading into the evening, where a totally different perspective of charm and majesty can be viewed. It is truly inspirational in its intricacy. You can also find: Serenity Inside the Zen House. We don't all have spa rooms so how do you relax at home? Let us know!